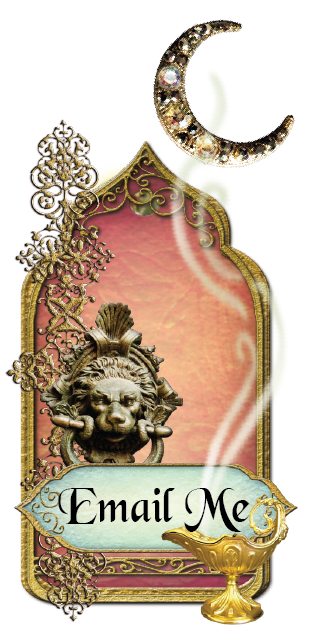 If you aren’t familiar with Tristan and his fabulous work, he is one of my fellow designers at Alpha Stamps. 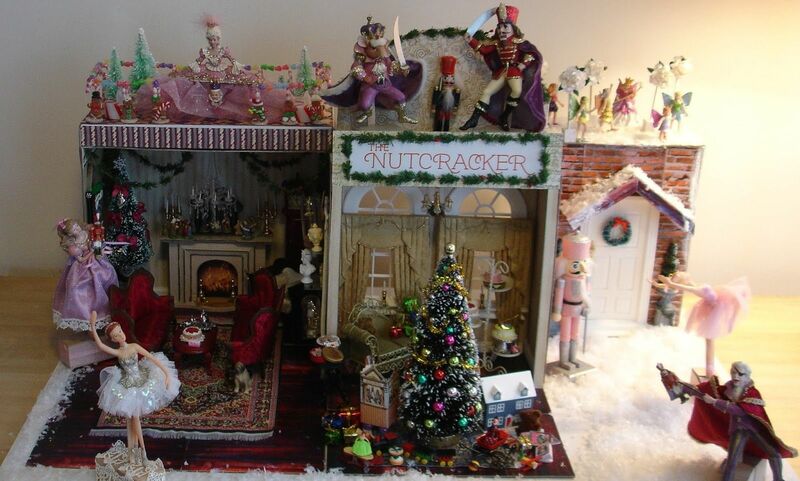 I thought that his Nutcracker Suite Theatre is magical and the attention to detail is so out of this world that I had to share it with you. 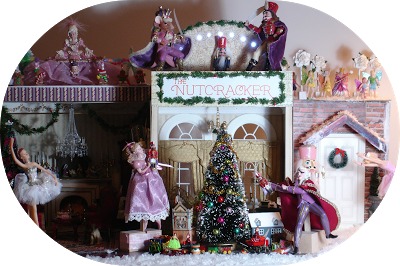 This is just a small sampling of the pictures and details of the wonderful piece Tristan created so hop on over to Tristan’s blog “Enchanted Revelries” to see more pictures and details about his creation, it's well worth it. While there, you might want to check out his other art and the beautiful eye candy he posts regularly. 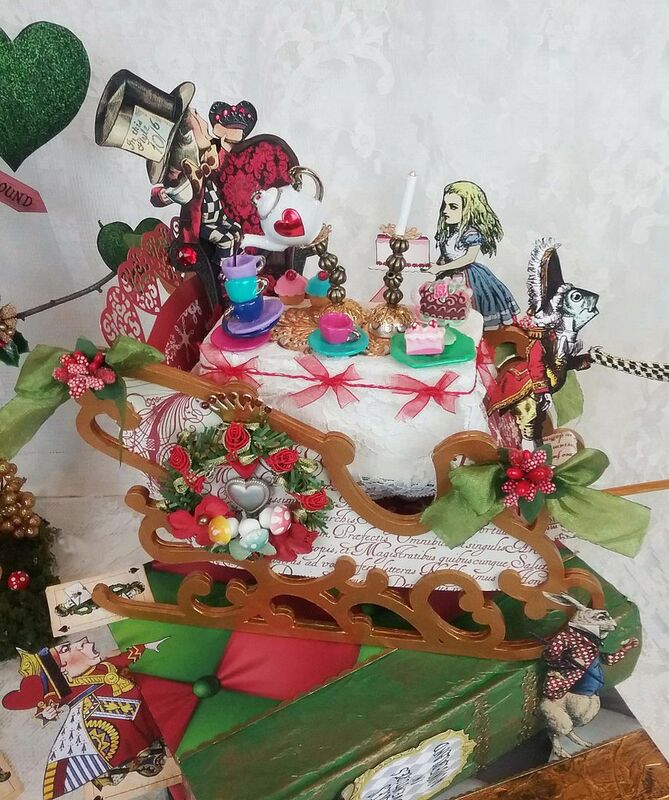 Oh no, it looks like Hatter has stolen the Queen’s sleigh and she doesn’t look happy about it. Of course, she’s never happy about anything. 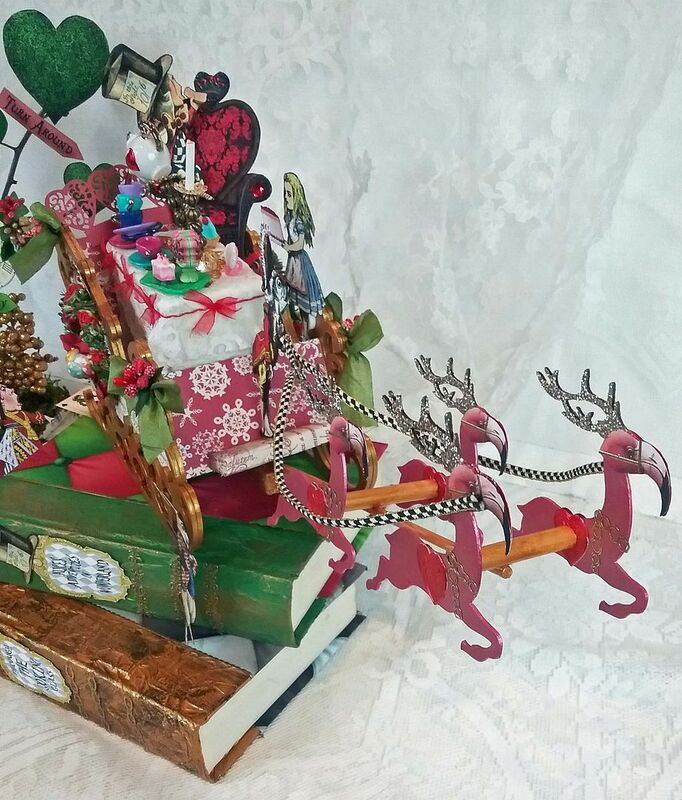 Isn’t it a beautiful sleigh all decked out for the holidays pulled by 4 flamingo reindeer. 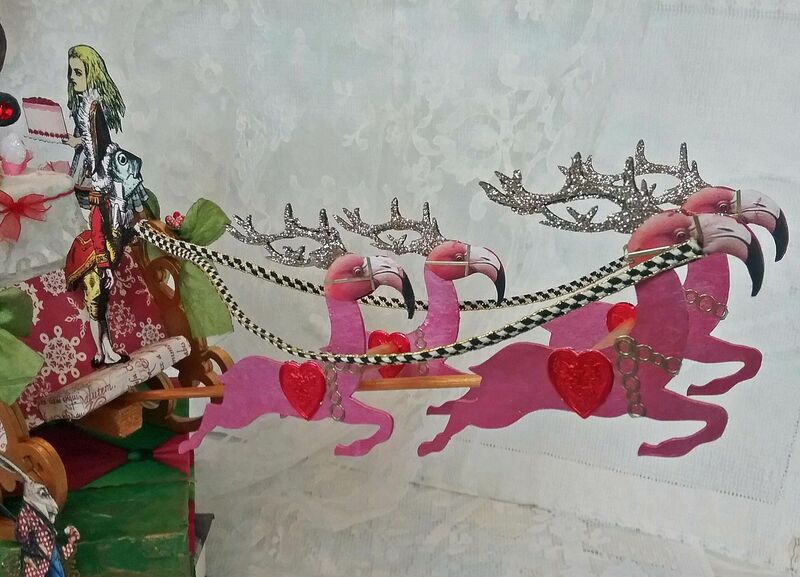 Flamingo reindeer make more sense to me because at least flamingos fly! The fish driver better watch out as the Queen is apt to make him supper. There is Hatter pontificating on something; in love with the sound of his own voice. 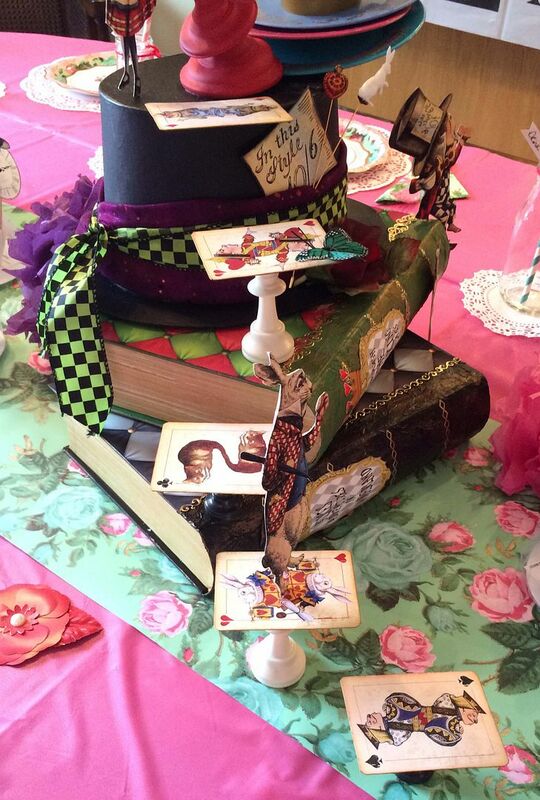 Of course in Wonderland tea pours itself, oh the magic of Glossy Accents! 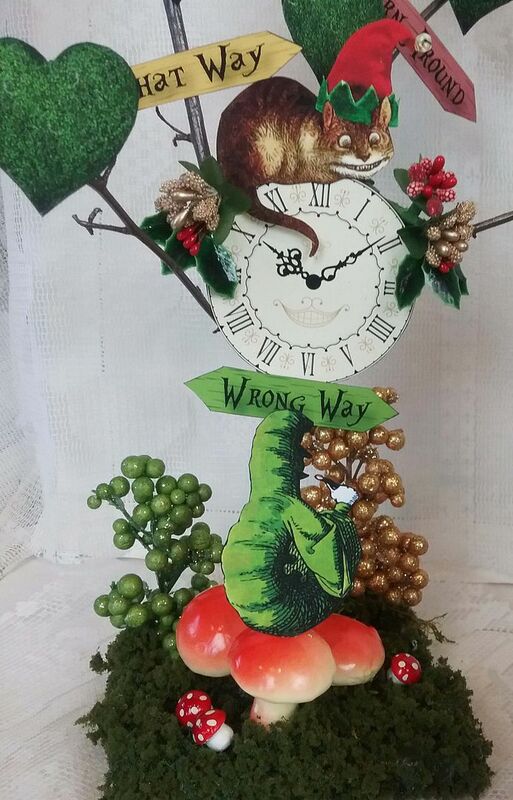 The Dormouse is peeking out of his door wondering what all the fuss is about. 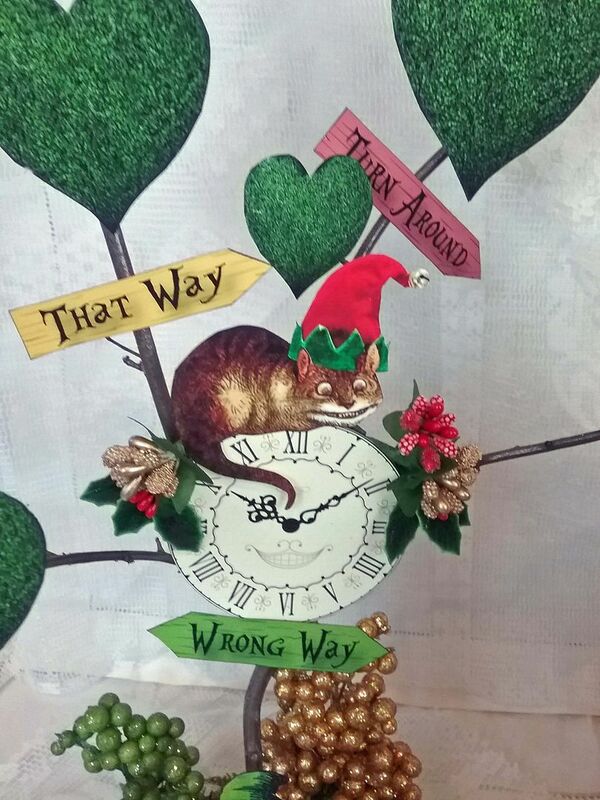 The Cheshire Cat is looking festive in his hat and the Caterpillar is as inscrutable as always sitting on a mushroom. 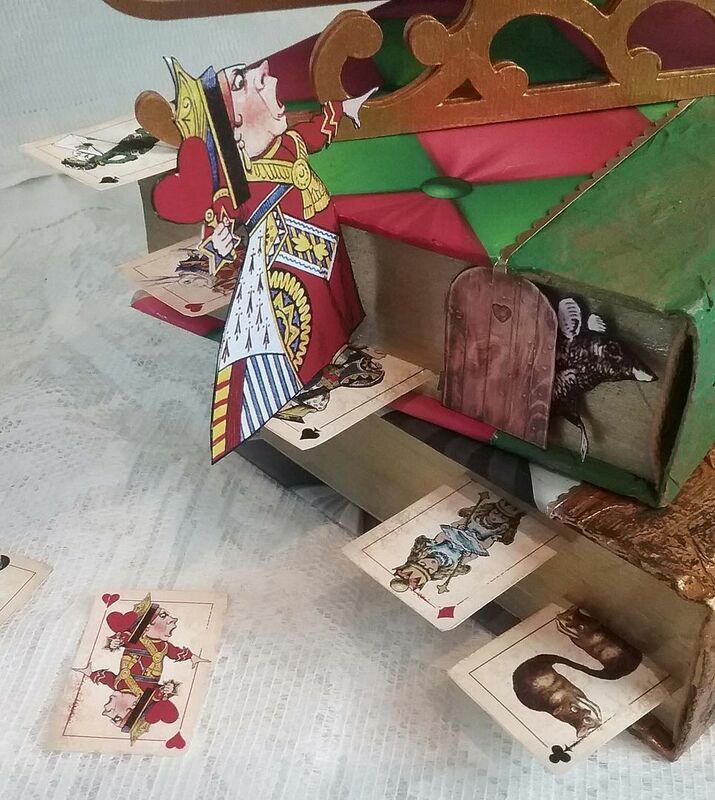 There’s the Queen climbing the playing card steps but I think it is too late as the flamingo reindeer are already in the air. 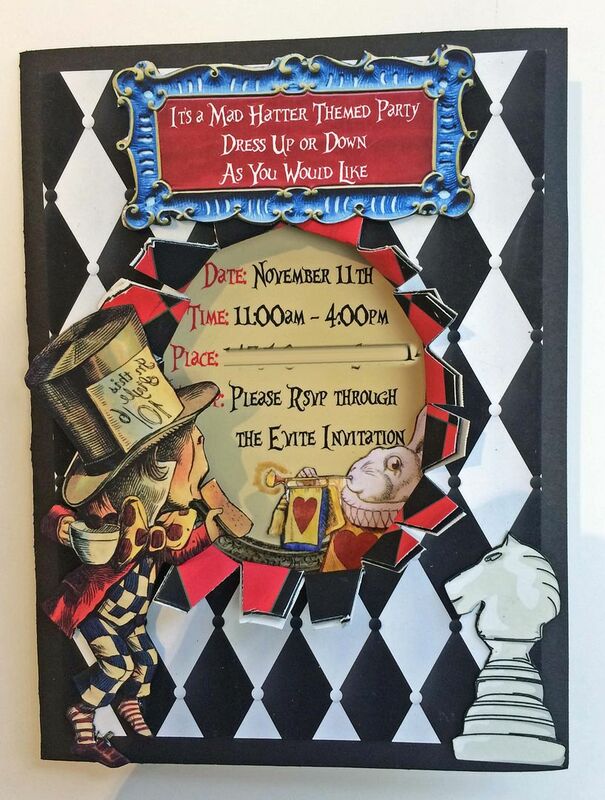 A few months ago my niece Hana and sister Lee asked me if I would help with Hana’s birthday party (which was Mad Hatter themed) by creating artwork for the party. 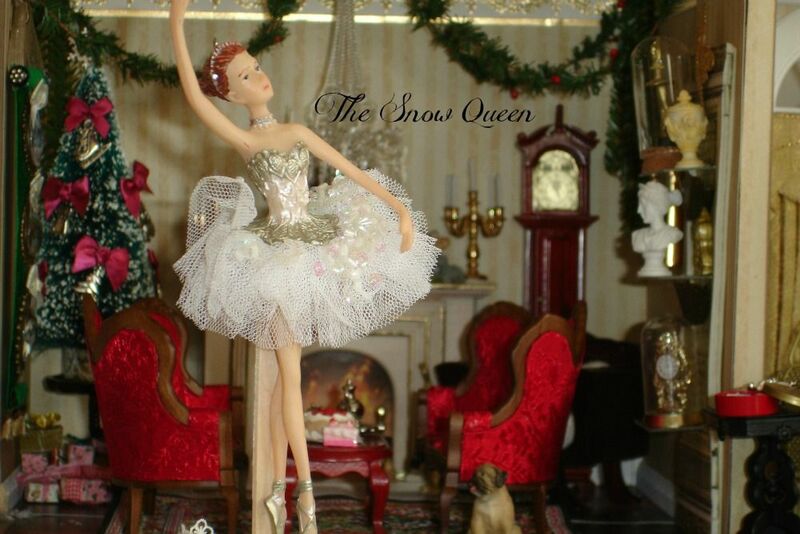 The main piece I created was a centerpiece (see below). 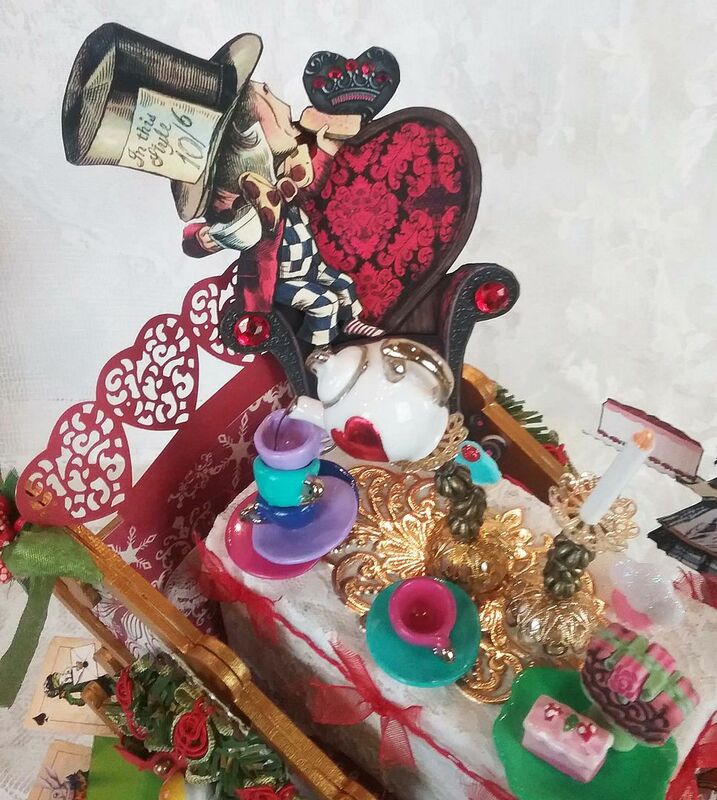 The sleigh project is just a reinterpretation of the large centerpiece I created for Hana’s Birthday. 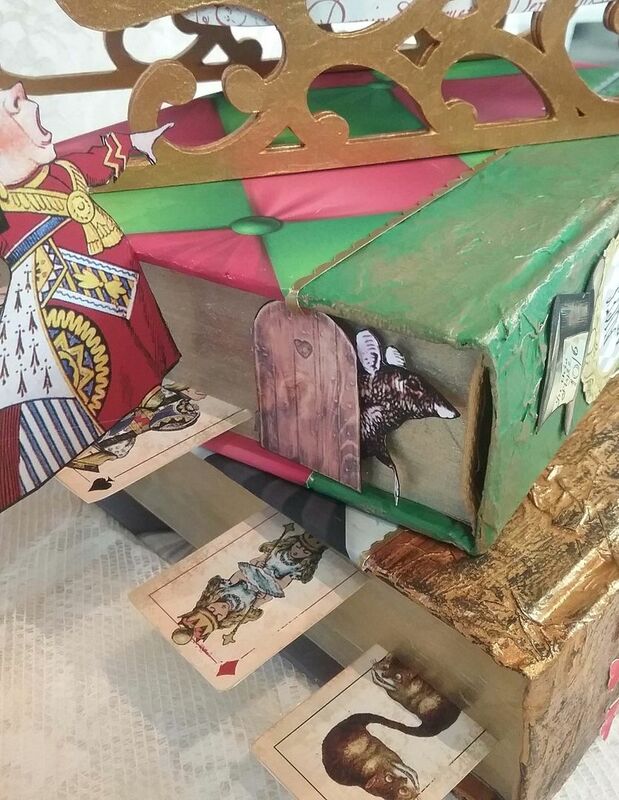 The card staircase is made using chess pieces. The cards are the large ones in the new digital image set. All of the characters are from my older Alice image sets. 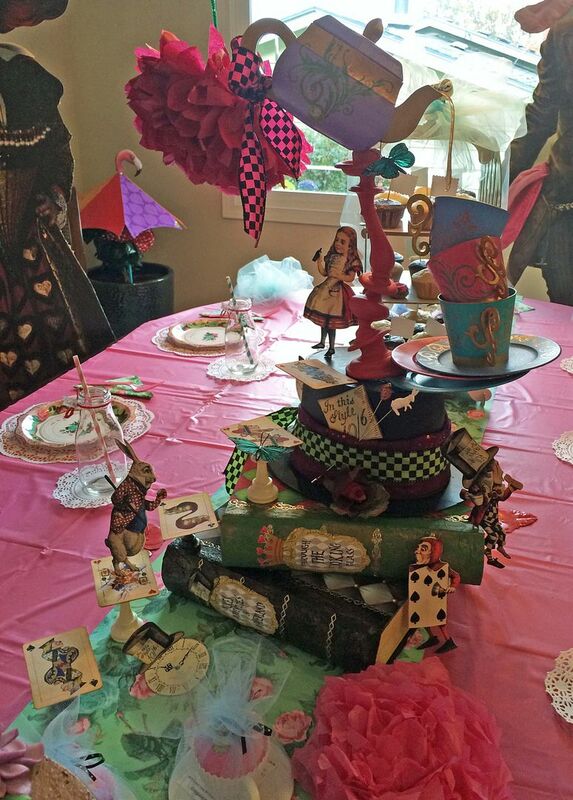 The hat and teapot are made of paper mache. The cups and saucers were clear plastic that I sprayed with plastic spray paint and applied rub-ons. I used chipboard swirls for the handles. Once again I used the Glossy Accents trick to make the tea pouring out of the teapot. Lots of E6000 glue holds everything together. I found the crooked candlestick online and it worked perfectly as a way to suspend the teapot. For the sleigh, I made my own crooked candlesticks using bead caps, beads, and filigree. 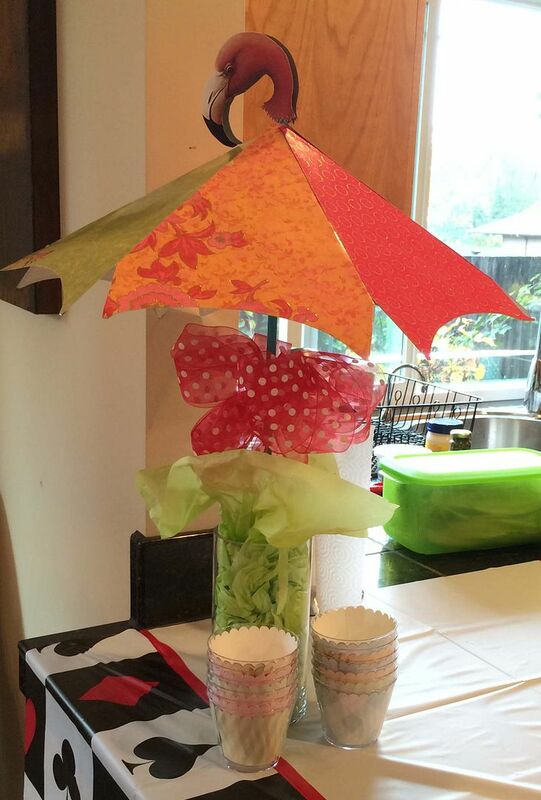 I also made some umbrellas and signs for the outside plus something to jazz up the party favors. 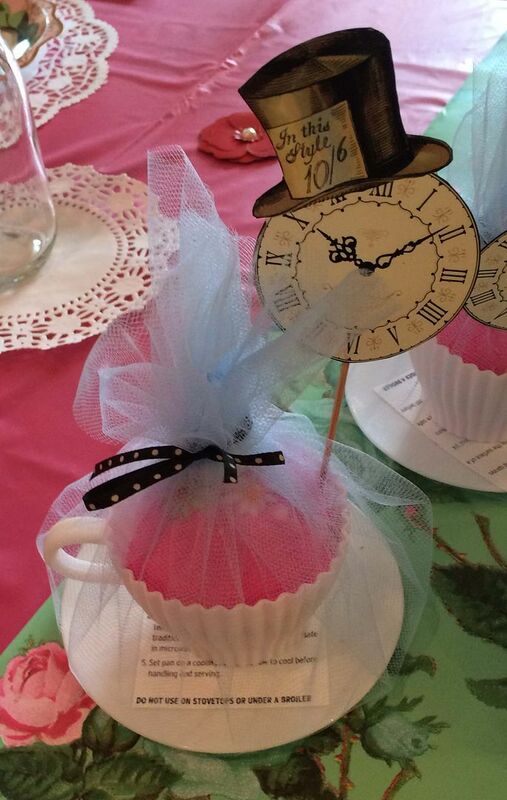 The clock and hat are on the new collage sheet. 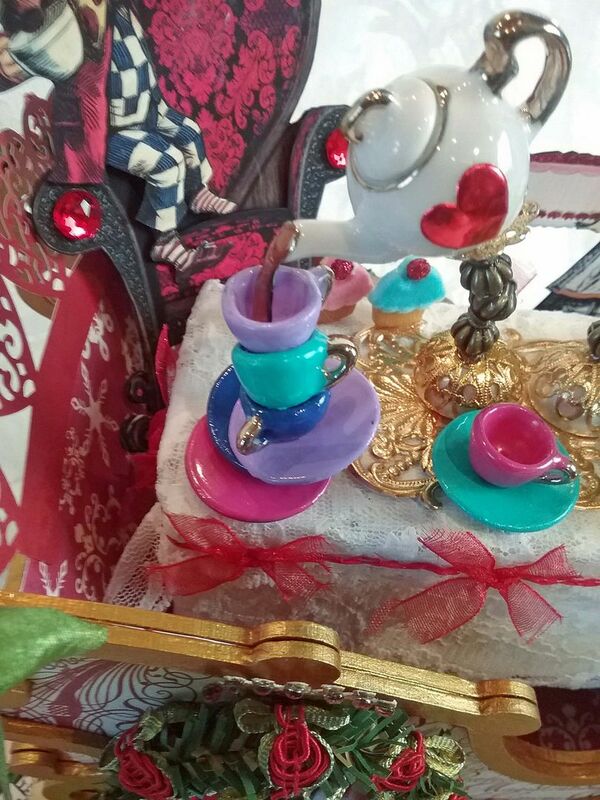 The teacups are holding a bath bomb. The cup is silicone and can be used to bake a cupcake (another great find on the Internet). I used one of my umbrella templates (supersized) to make the umbrellas. The flamingo head is the same one on the new collage sheet. 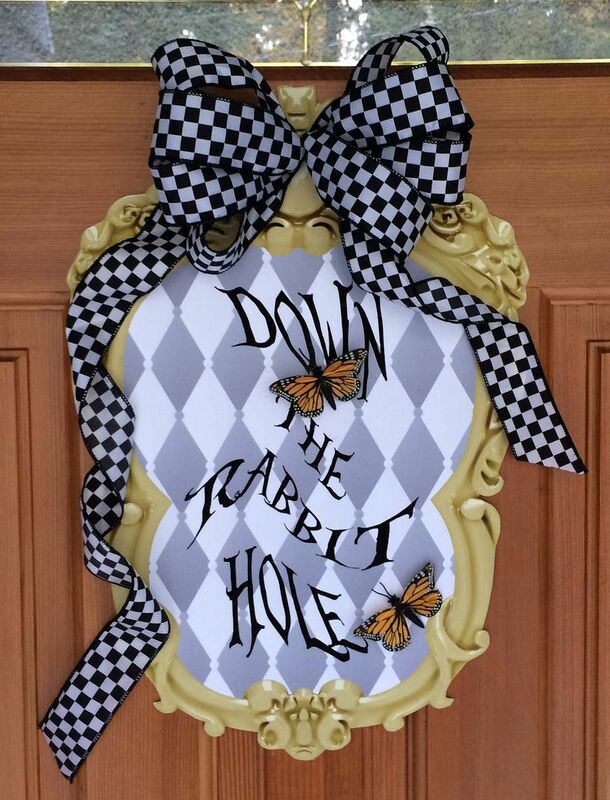 Smaller versions of all of the images seen below are in my Alice image collections. 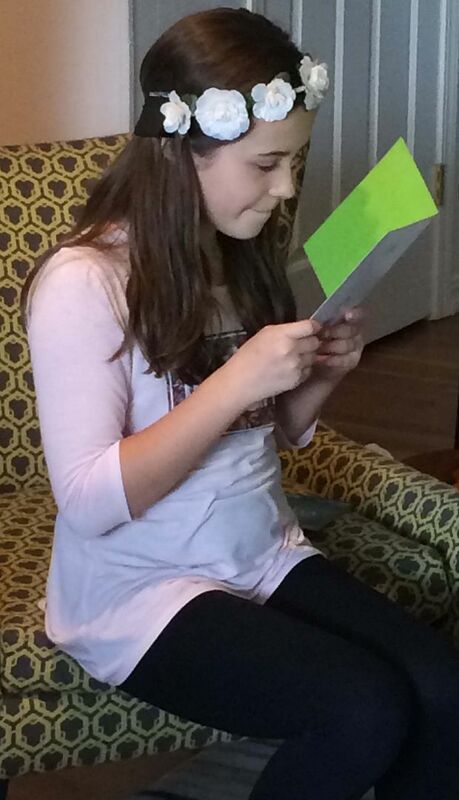 I even made custom invitations for all of her party guests. The papers I used for both covering the books and for the invitations are in the new Tea Party Alice digital image set. The hardest part of this project was that I live in Arizona and my sister and niece are in Oregon. I had to make all of the pieces here, pack them in my suitcases and then assemble and finish them once in Oregon. Lots of work but it was a labor of love! My sweet niece Hana pictured below. 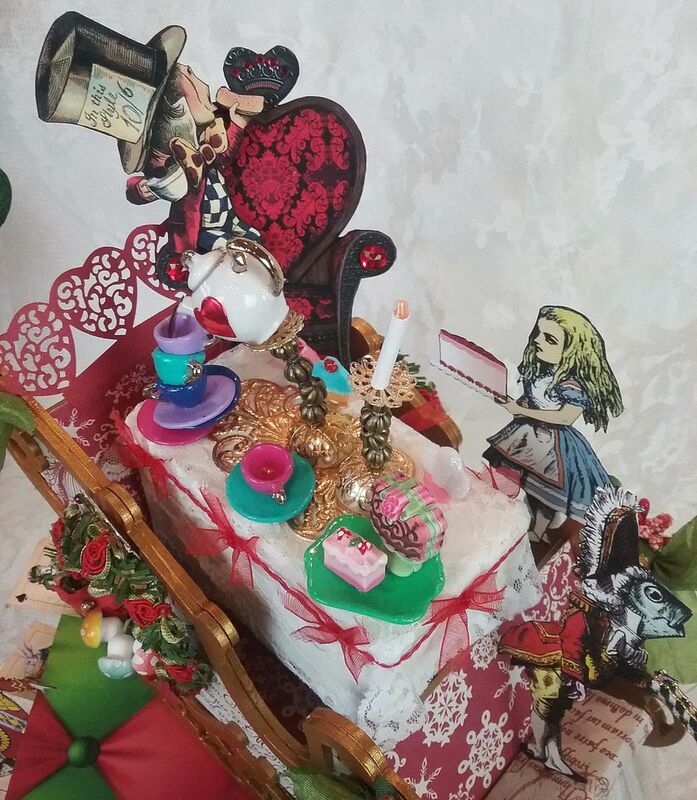 To go along with the sleigh project, I’ve created a new Alice themed collage sheet and a companion digital image set which includes all of the images on the collage sheet and tons more. 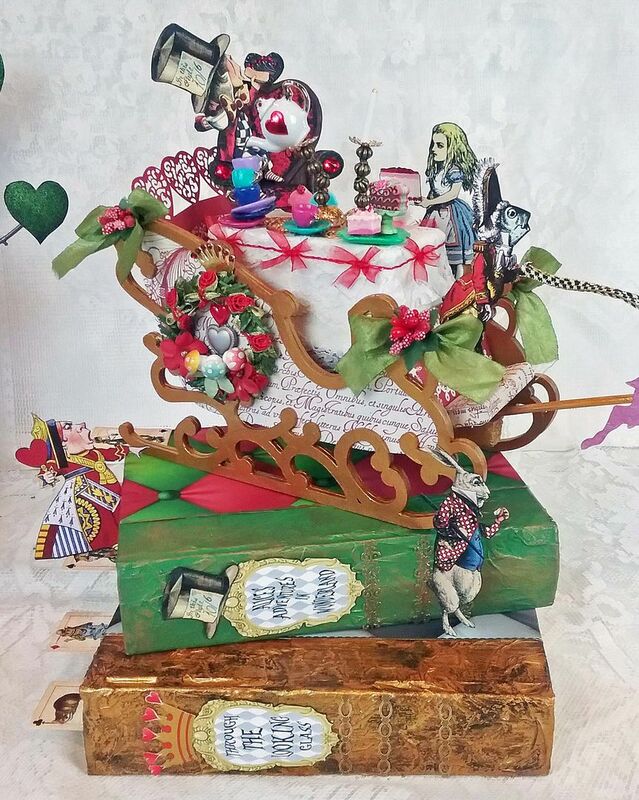 All of the image I used for the sleigh project (except for the Cheshire’s hat) came from the new Tea Party Alice collage sheet and image set and from my older “We’re All Mad Here” collage sheet and “Wonderland” digital image set. 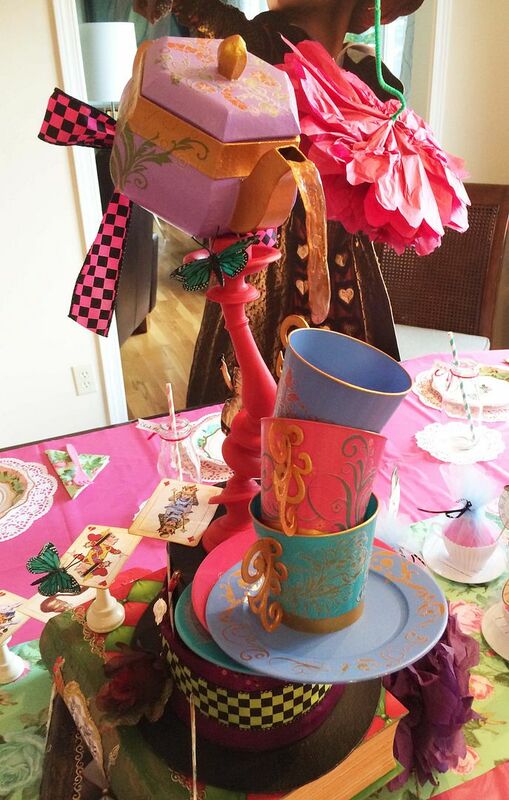 This sheet is filled with fun Alice inspired items. Some of my favorite images are the umbrella with the pink flamingo handle the red heart chair and the playing cards. 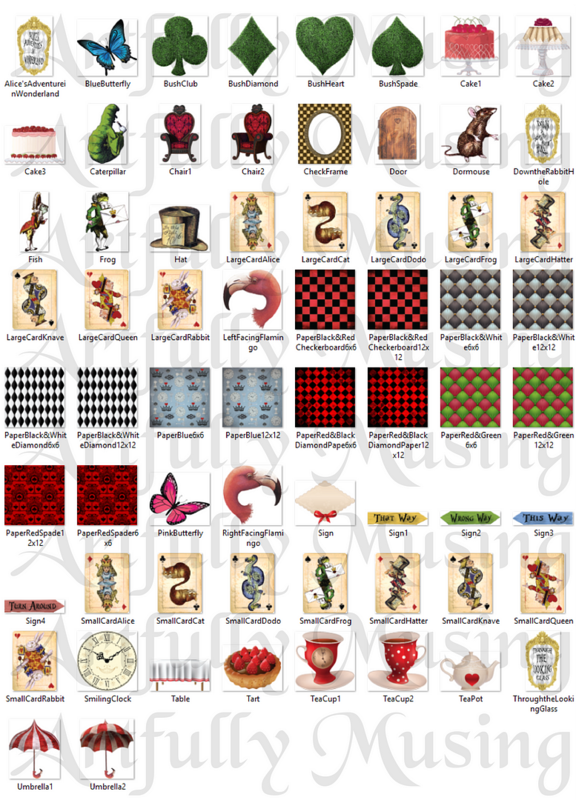 This set includes all of the images found on the Tea Party Alice collage sheet plus an additional 39 images for a total of 65 images. 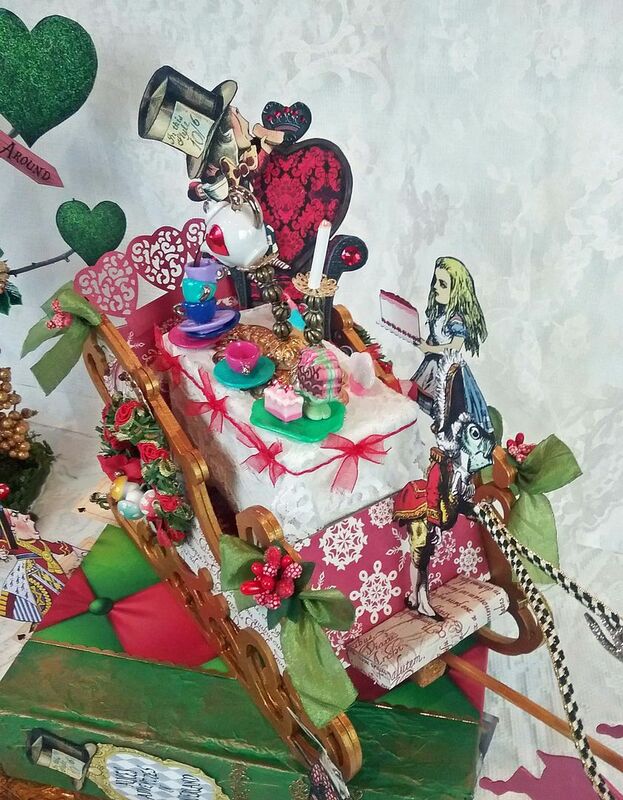 In the tutorial below I’ll cover how I made the Alice themed Holiday Sleigh. 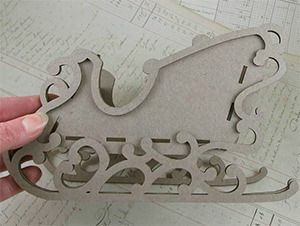 The sleigh is made using a chipboard kit of 7 pieces. I started by gluing 5 of the sleigh parts together (front, back, bottom, and sides). 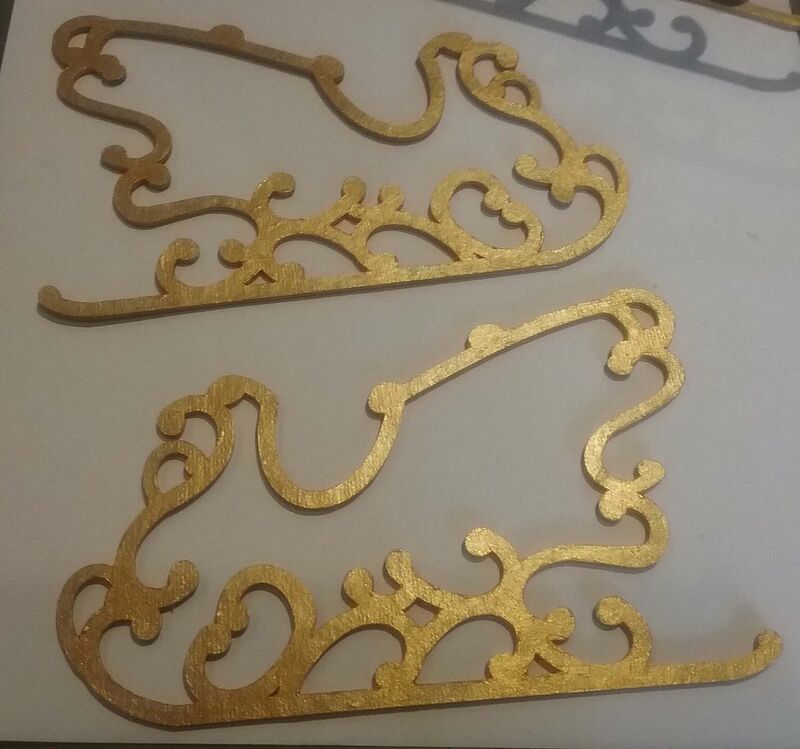 I did not attach the two scrollwork pieces at this time. 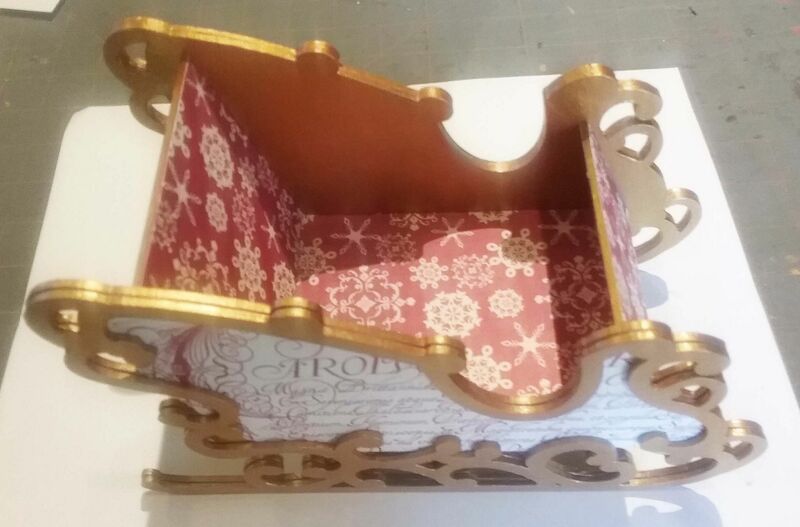 Next, I painted the parts of the sleigh that were not being papered (scrollwork and the inside of the sides). 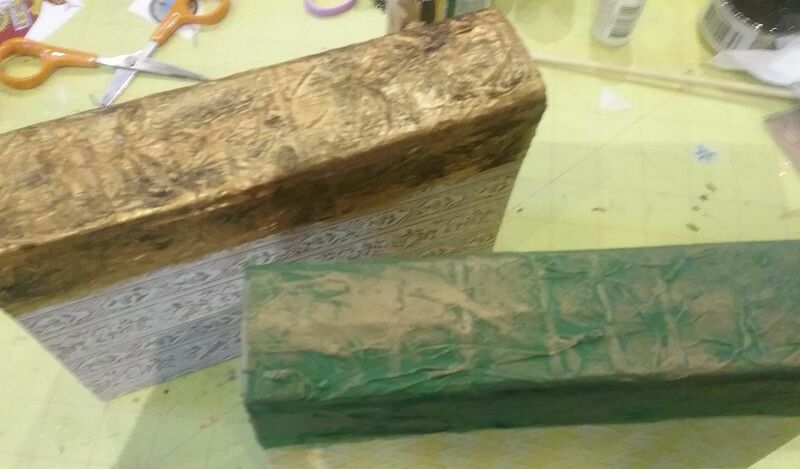 I also painted the two separate scrollwork pieces. 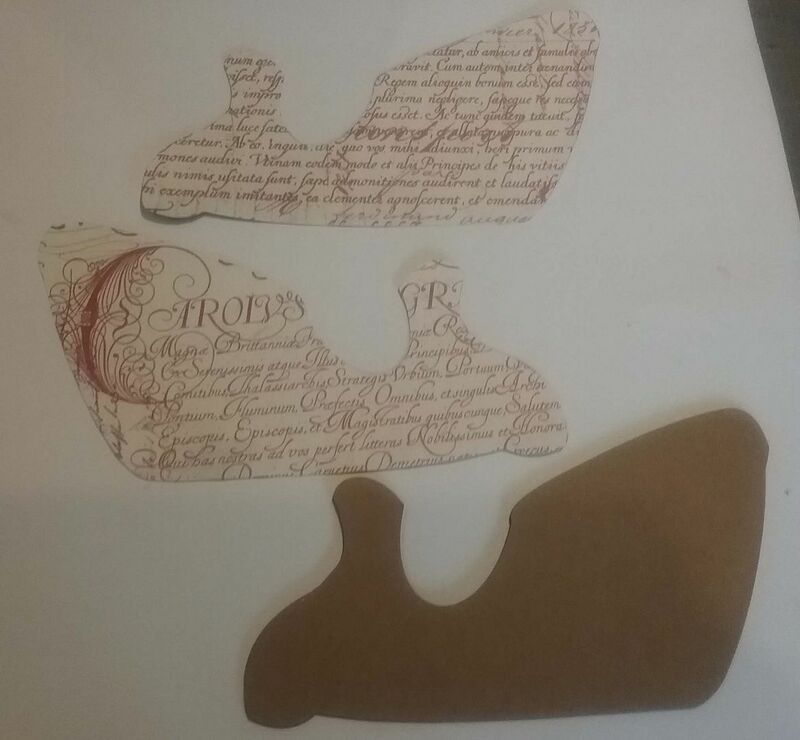 One of the best things about this kit is that it comes with a template that matches the dimensions of the side of the sleigh. 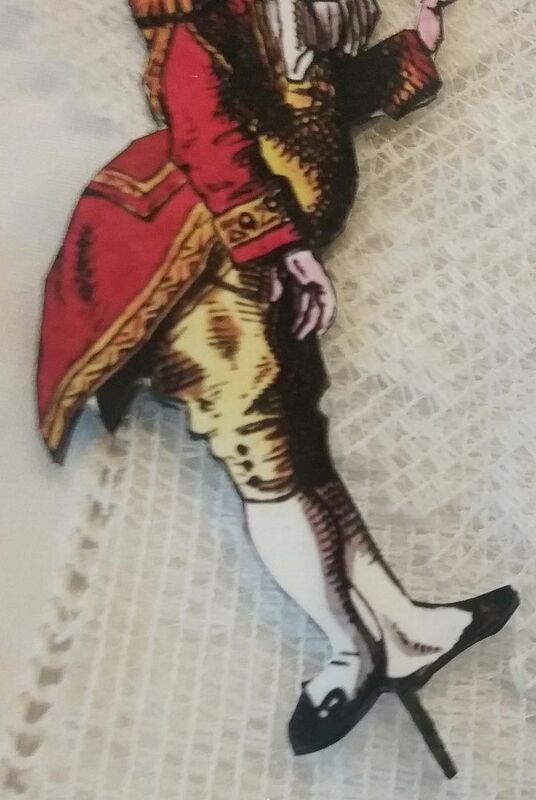 Imagine, trying to cut out a piece of paper to fit the sides, while trying to avoid all that scrollwork. With the template, it was a breeze to trace and cut paper for the sides. Next, I attached the paper and then attached the two separate scrollwork pieces. I then added paper to the front and the back pieces and to the inside bottom piece. 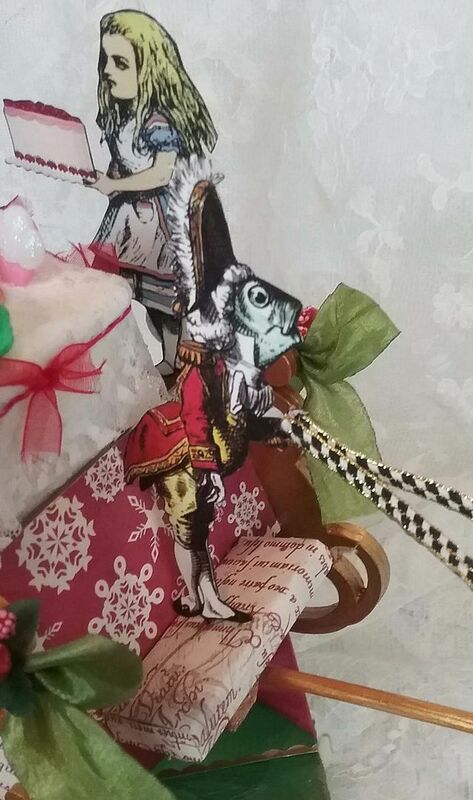 For the ledge that the fish driver stands on, I used a narrow matchbox covered in paper. So that the driver would stand, I glued a flat toothpick between the two sides of the character. All of the characters in the project are double sided so that they look the same from all angles. Using the matchbox as the ledge gave me something to poke the toothpick into. 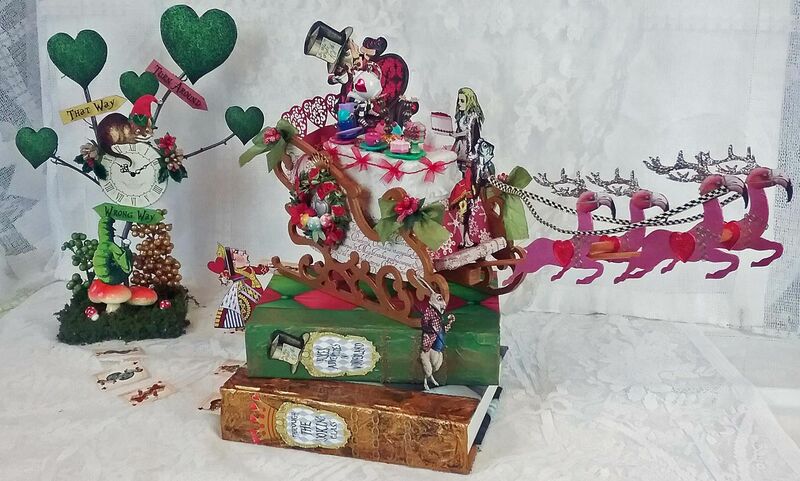 Below you can see the matchbox glued to the bottom front of the sleigh. 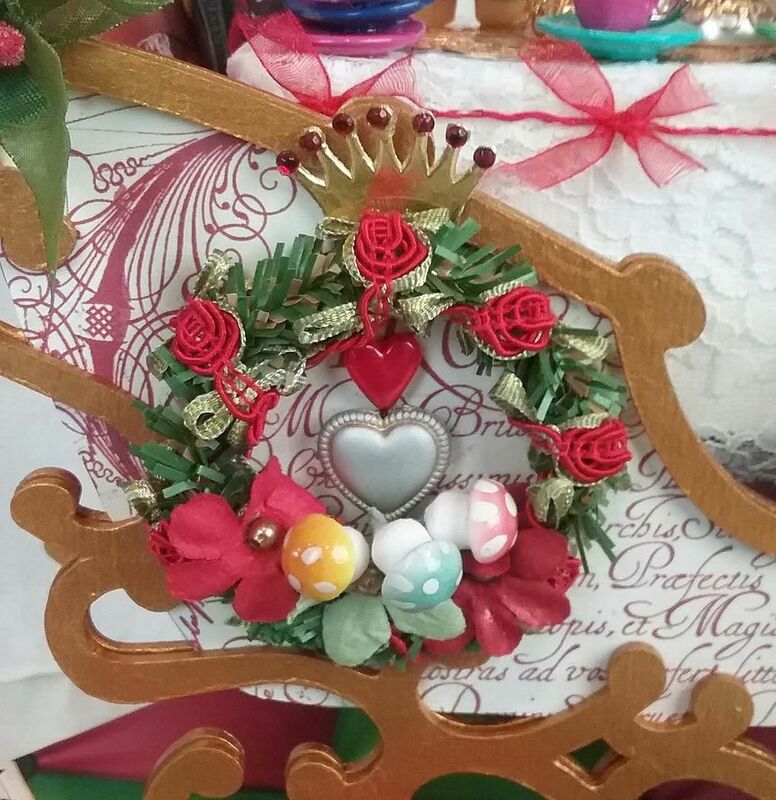 To decorate the sides of the sleigh I made two wreaths (one for each side). 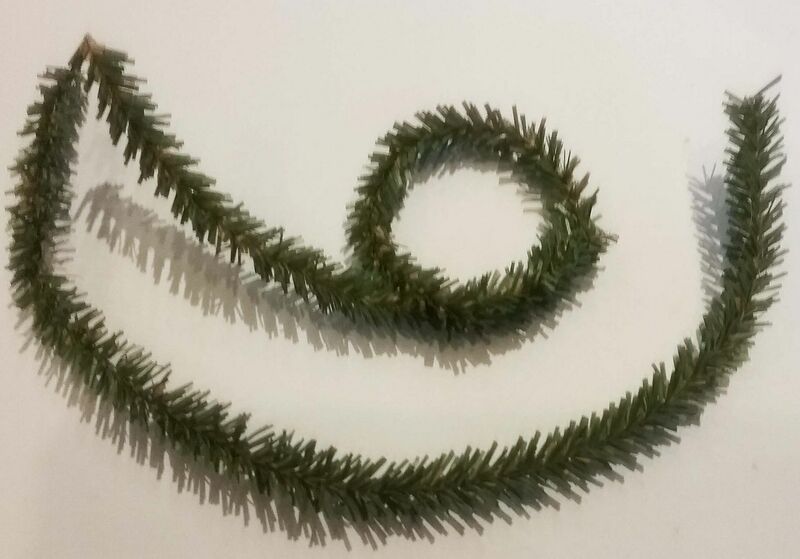 I started by making a circle using wired pine needle stems. Next, I wrapped the circles in rose ribbon braid. 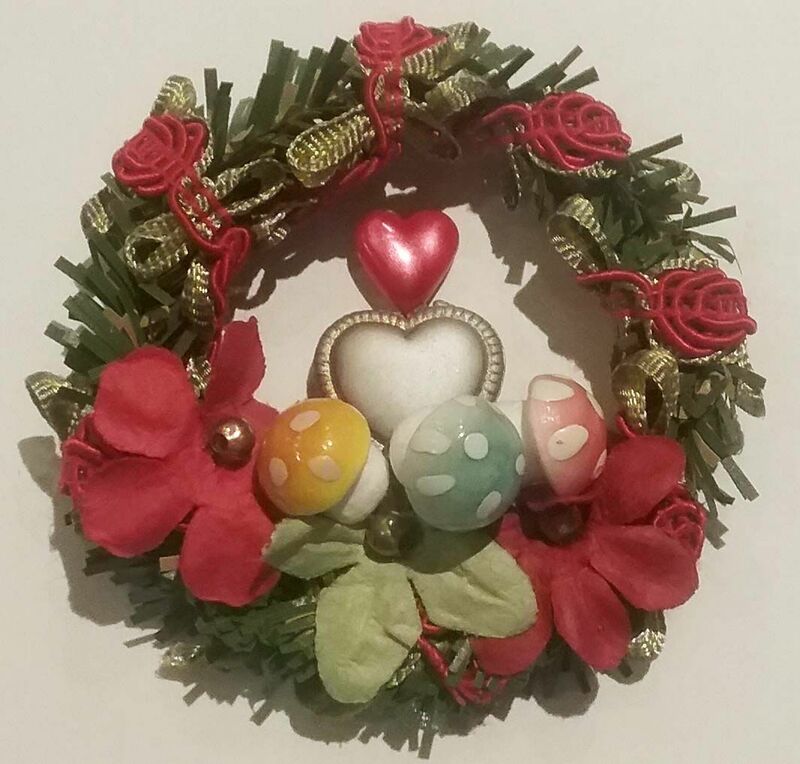 Then I attached the flowers and mushrooms. 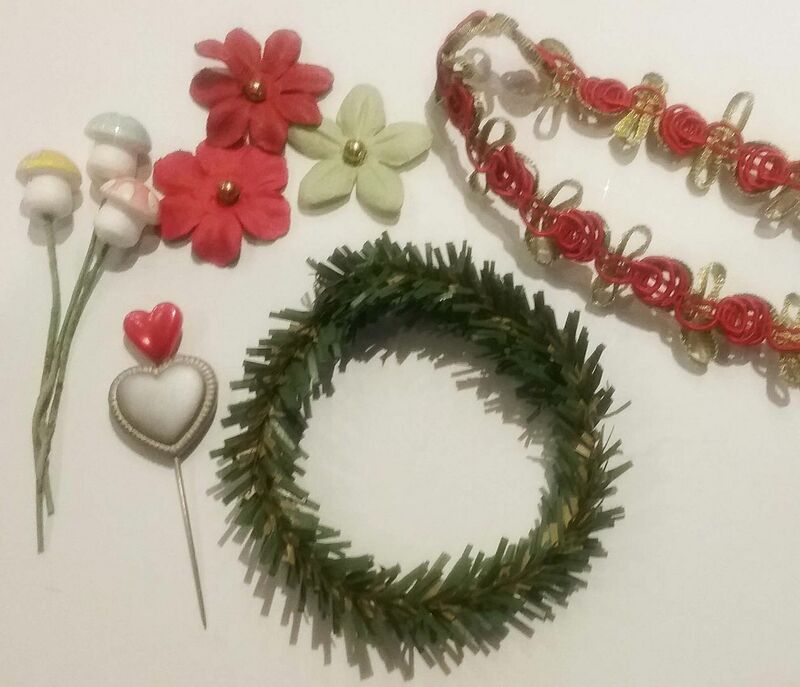 Lastly, I added the red heart stickpin and silver heart bead. 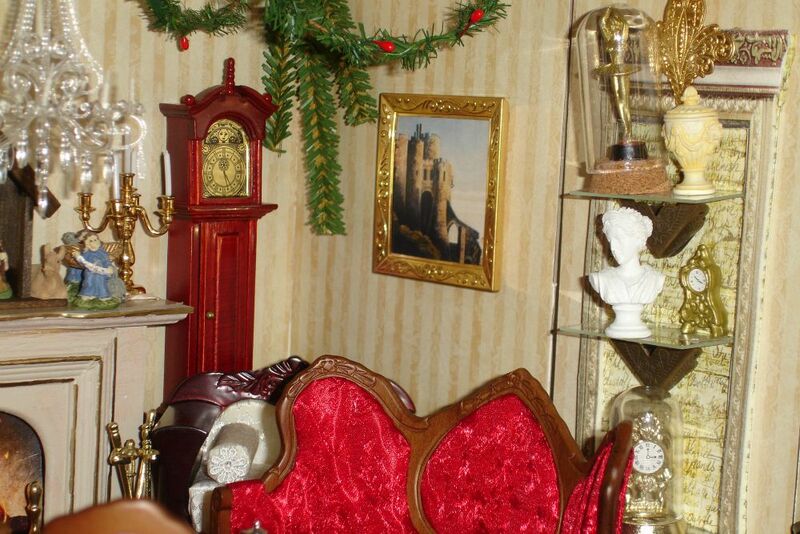 Once I had the sleigh decorated with the wreath, I decided it needed one more touch and added the Dresden crown with rhinestones. 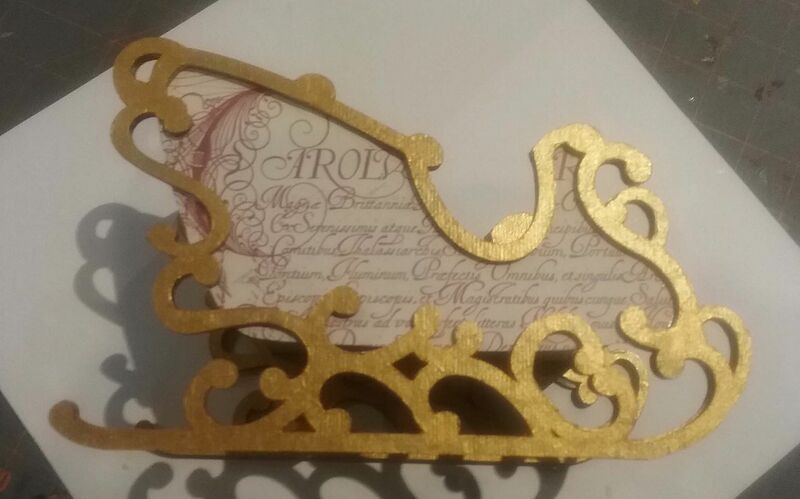 After all, it is the Queen’s sleigh so it needed a crown! In addition to the wreaths, I decorated the sleigh with ribbons and holly berries. 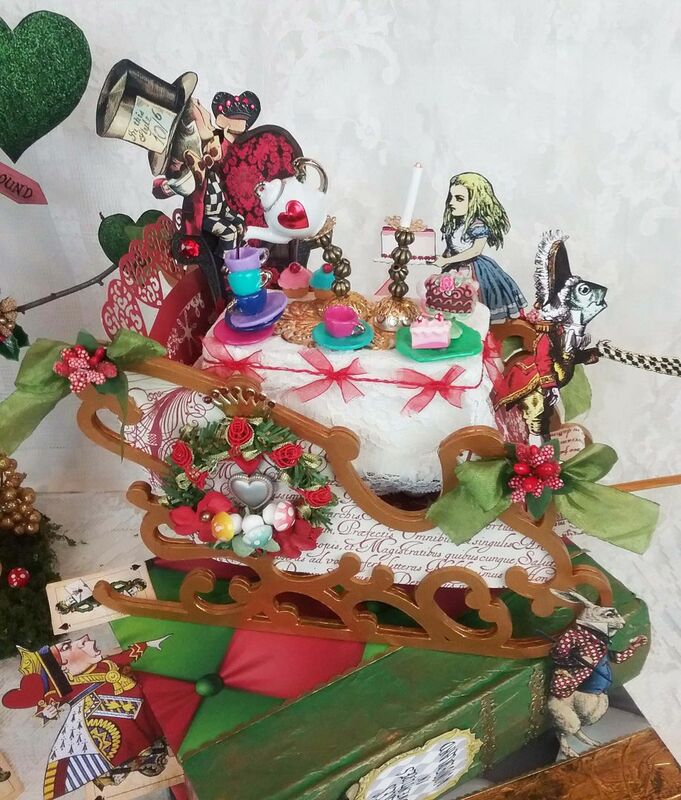 I also used part of a heart cupcake wrap to dress up the back of the sleigh. To make the table I used two 1" wood blocks. 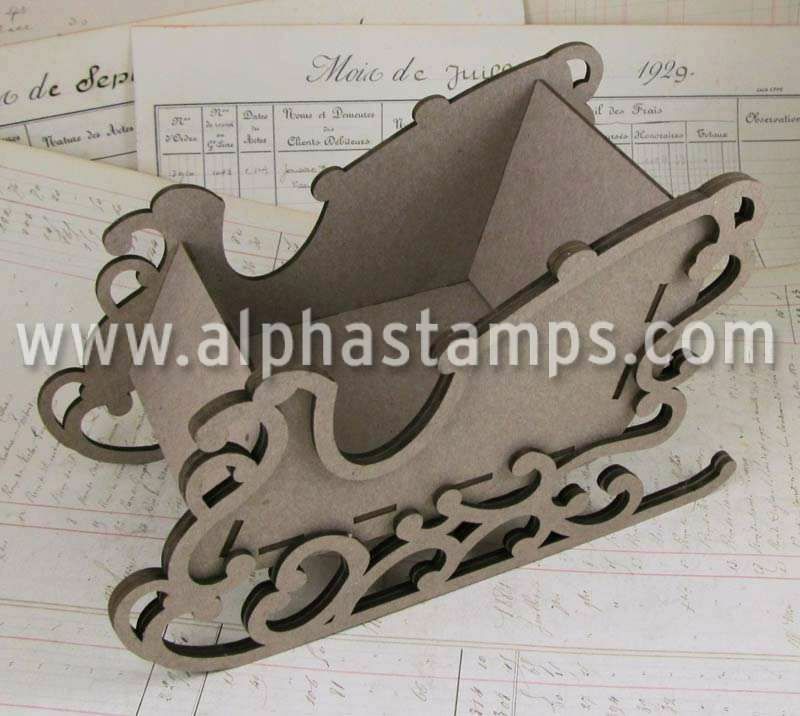 I choose the blocks as they were a perfect fit for the sleigh. 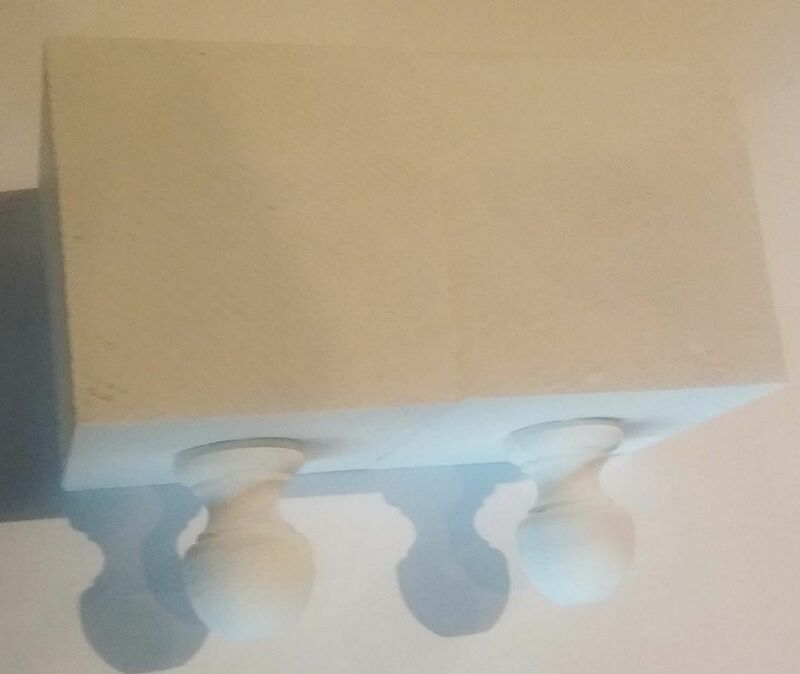 As legs and to make the table higher I used two wooden finials. 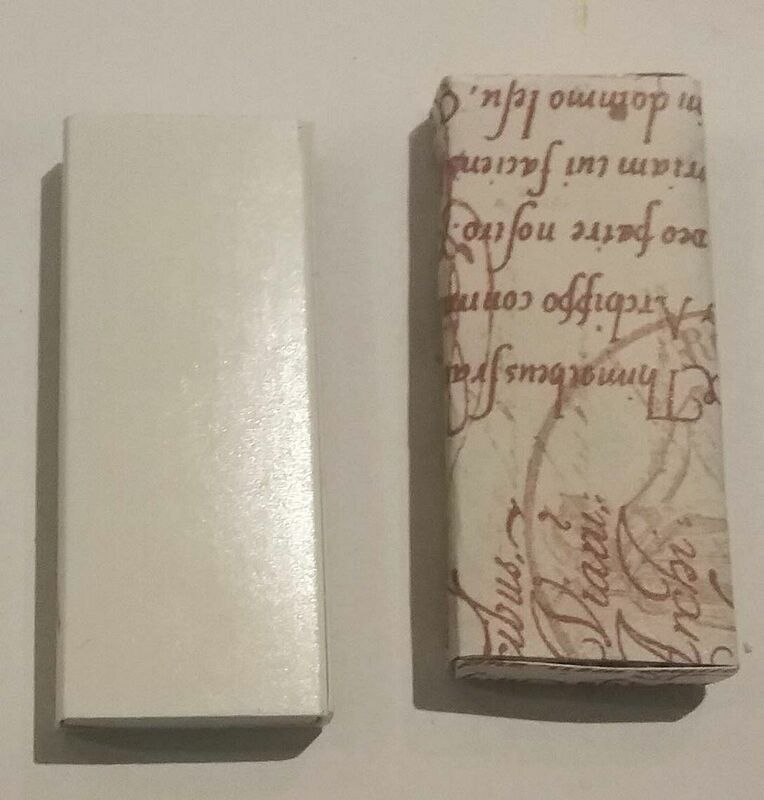 I glued the blocks together, glued the finals to the blocks and then painted everything white. I covered the blocks with white lace from my stash and wrapped the table with red bow wired ribbon. On the top of the table, I added a piece of gold Dresden. 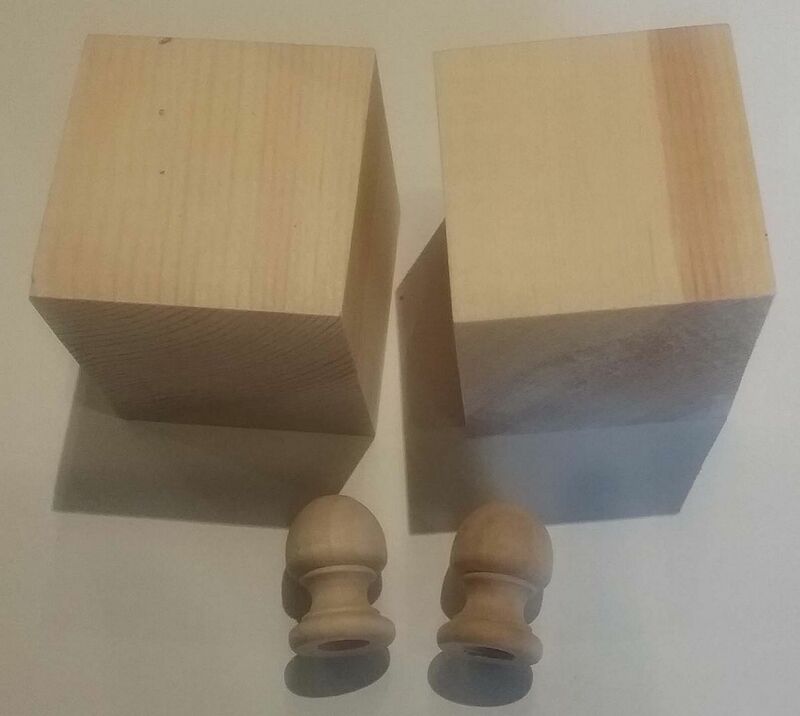 One of the main pieces on the table is the pair of crooked candlestick holders. I started with the bead cap and glued the first bead on at a slight angle. This is definitely a job for E6000 glue. Once the glue was dry, I added the next bead and so on until finally adding the filigree to the top. 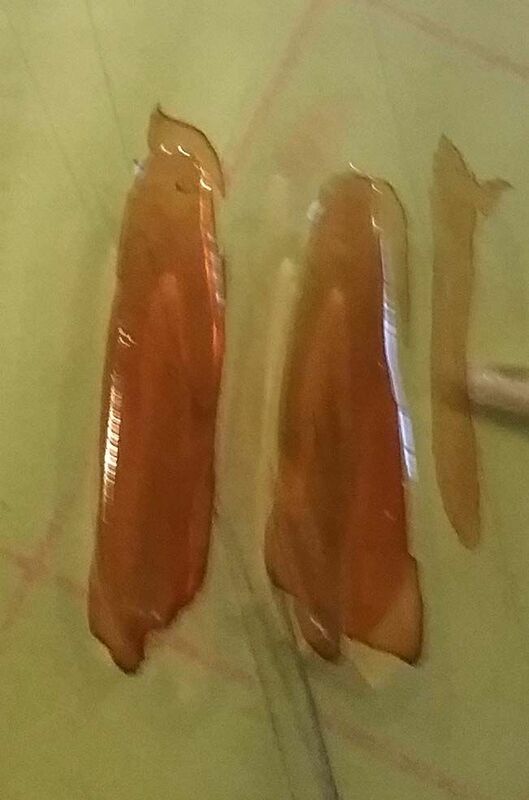 It’s really important to let the glue dry thoroughly between each piece before adding another piece. When I was finished I decided I needed a large surface on the bottom to glue to the table so I glued a flat back bead underneath the bead cap. 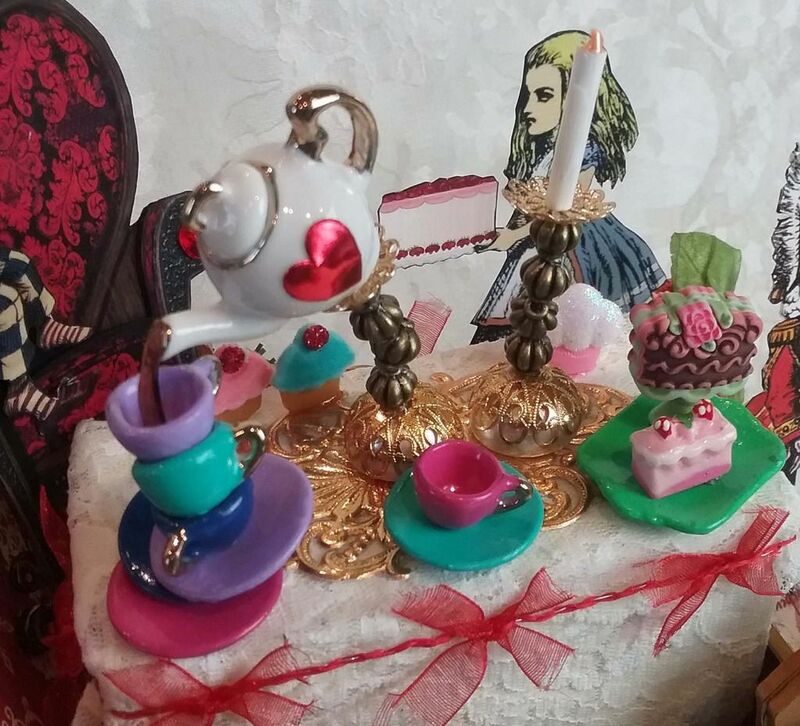 Lastly, I glued the teapot at an angle on one of the candlestick holders and a candle on the other. The candle is a piece of plastic painted white and tipped with yellow paint. 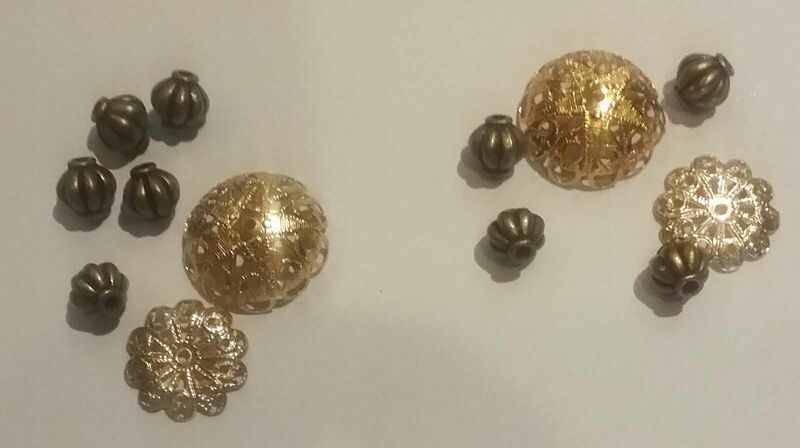 In the picture below, you see the two candlestick holders glued to the table on top of the piece of gold Dresden. As you can see from the picture above, I glued a stack of plates and cups in a staggered fashion, again using E6000. I painted the cups and saucers in bright colors using Patina Paints. To make the tea pouring into the cup I used Glossy Accents. On either a piece of rigid plastic or wax paper dispense a ribbon of Glossy Accents. The length depends on the distance between the spout of the teapot and the top cup. I did a few so I could choose which one to use. Once the Glossy Accents is dry paint it with Alcohol Ink and glue it to the spout of the teapot and presto you have tea. The tea set also came with a tray which I painted and then attached some sweet treats. The cake is made from two buttons. I removed the shanks then glued them together to make the cake look more 3D. 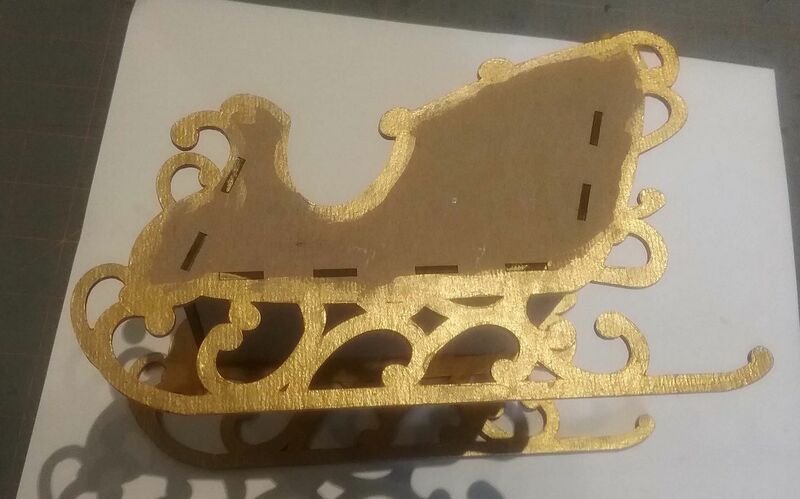 Below you can see the finished decorated sleigh. 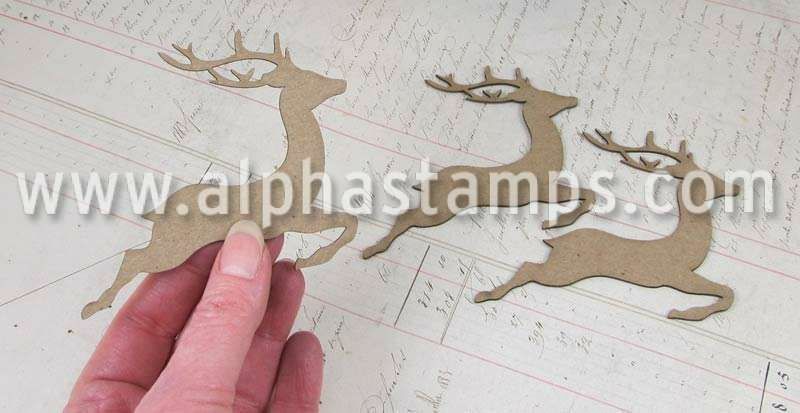 I started with a set of 4 chipboard reindeer (they come 8 in a set). First, I painted them a pink shade that was close to the color of the flamingo head images on the collage sheet. Next, I rubbed them with Fire Brick Distress Ink to give the color more variation and to add more of the color of the head image. I then added gold stickers to serve as the harness and Dresden red hearts function as the saddles. I used Distressed Glitter Dust (Vintage Platinum) to give the antlers sparkle. 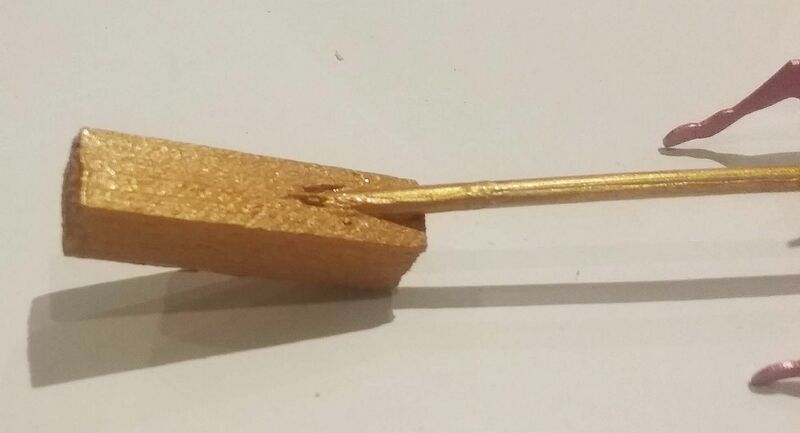 To connect the reindeer together I cut two wooden dowels 2” long, painted them gold and glued them in between each pair of reindeer. 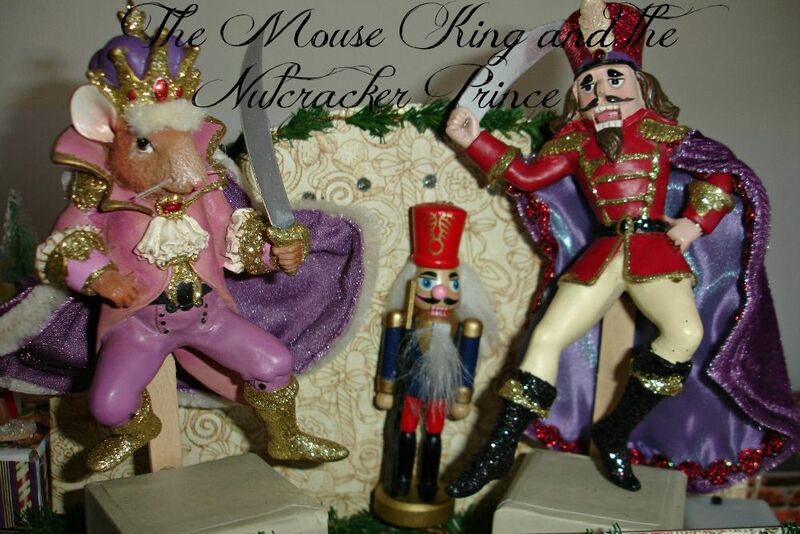 Next, to connect the reindeer pairs together, I used a wooden skewer (painted gold) that I glued underneath the dowels. In order to attach the reindeer to the sleigh and to make them fly, I used a piece of balsa wood. I choose balsa wood because it is easy to poke a hole in the softwood. The hole is at an angle in the wood so that the reindeer will tilt up as if flying. 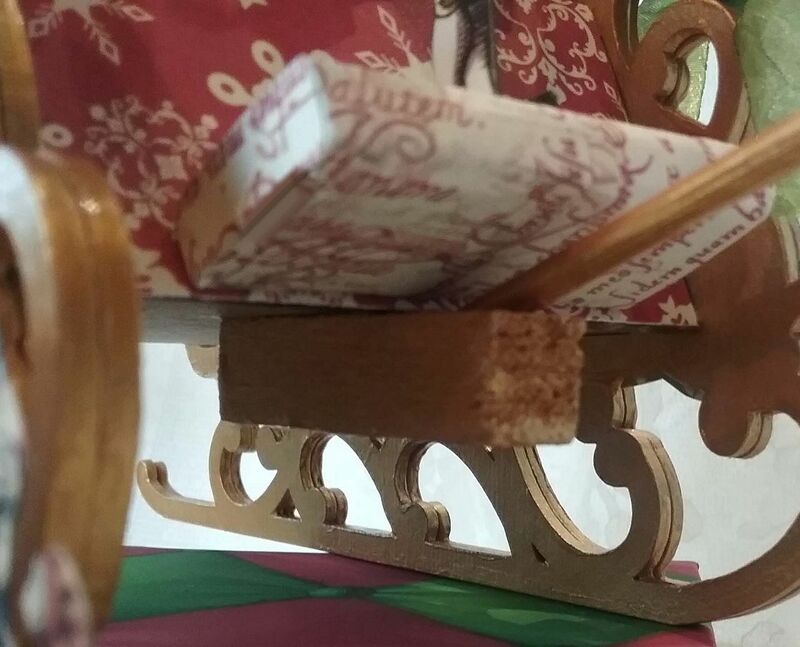 To attach reindeer to the sleigh I glued the balsa wood underneath the sleigh and the driver's ledge. 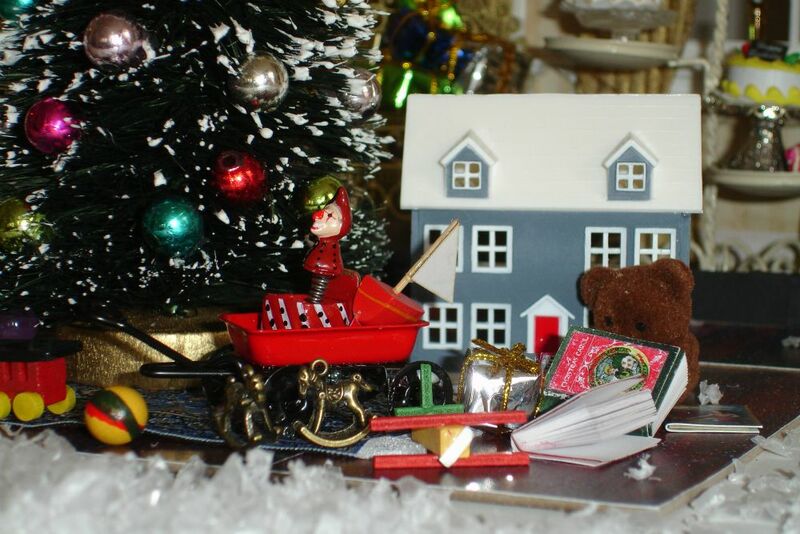 The sleigh and drivers ledge (made from the narrow matchbox) hides the balsa wood. To give the piece more interest and height I decided to create a base made from books. 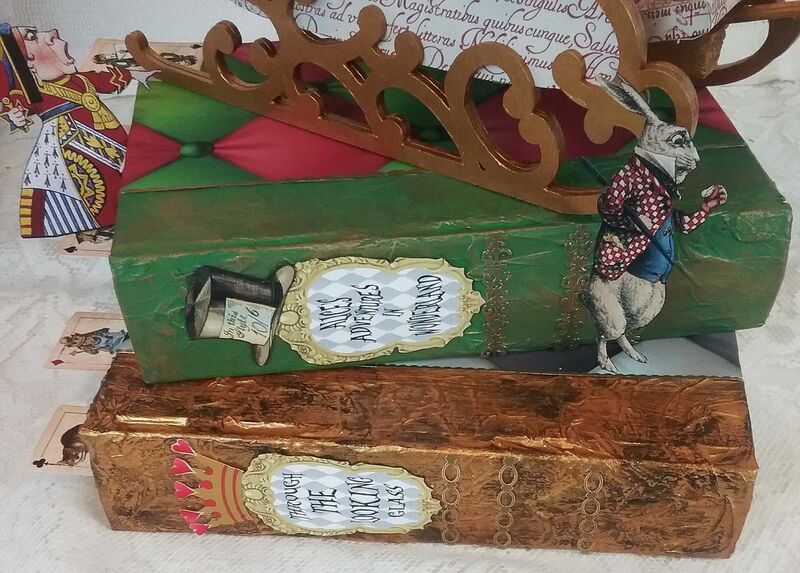 I have a large stash of old Reader’s Digest Best Loved Books that I use for altered book projects. I started by covering the spines with torn and crumpled tissue paper (for texture). I’m not going to go into detail on this technique as I have covered it previously with a video tutorial. 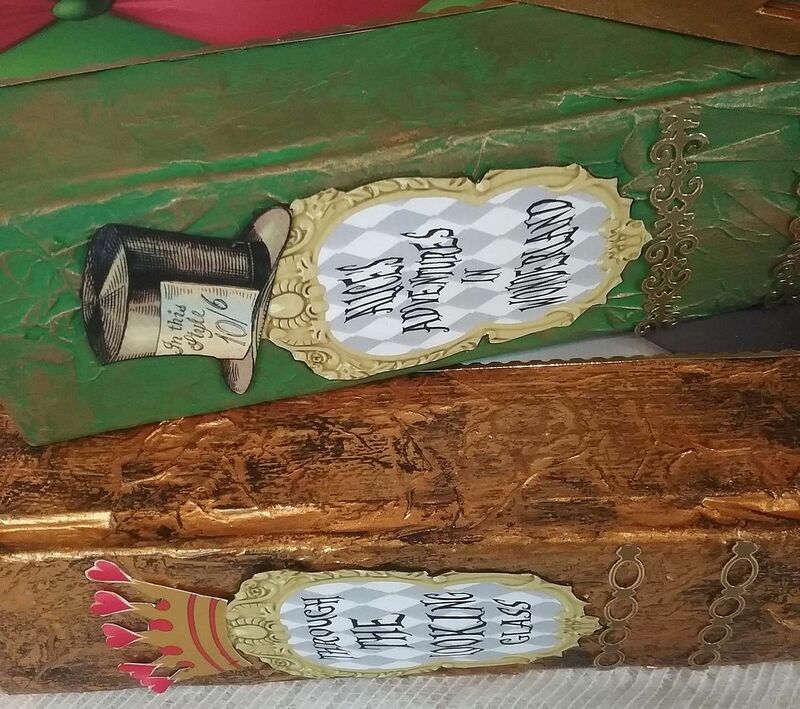 Next, I painted the spines, one green, and one gold. 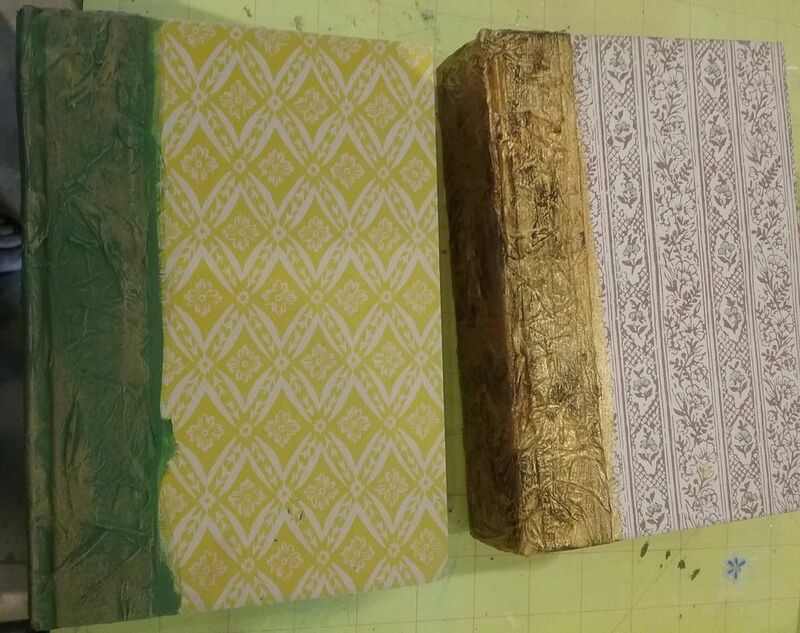 I rubbed gold on the green spine and black on the gold spine. 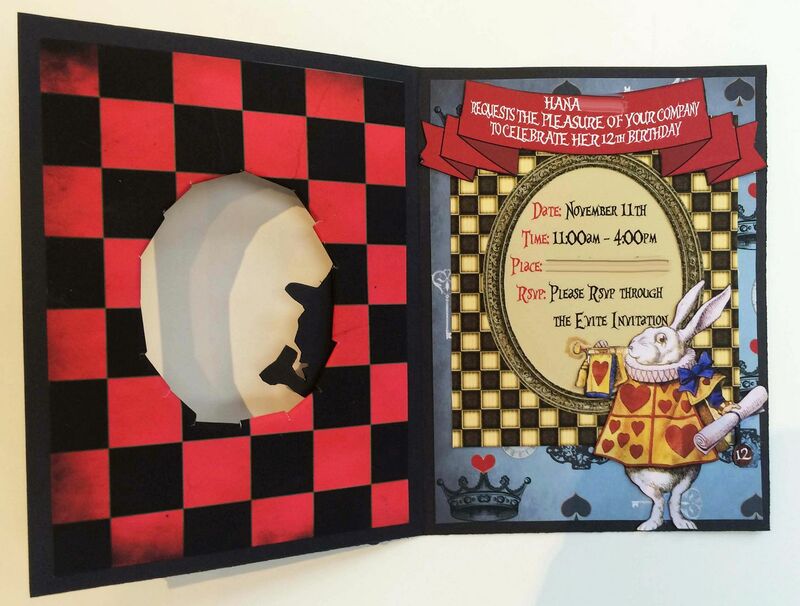 Using paper from the Tea Party Alice digital image set, I covered the rest of the book cover. 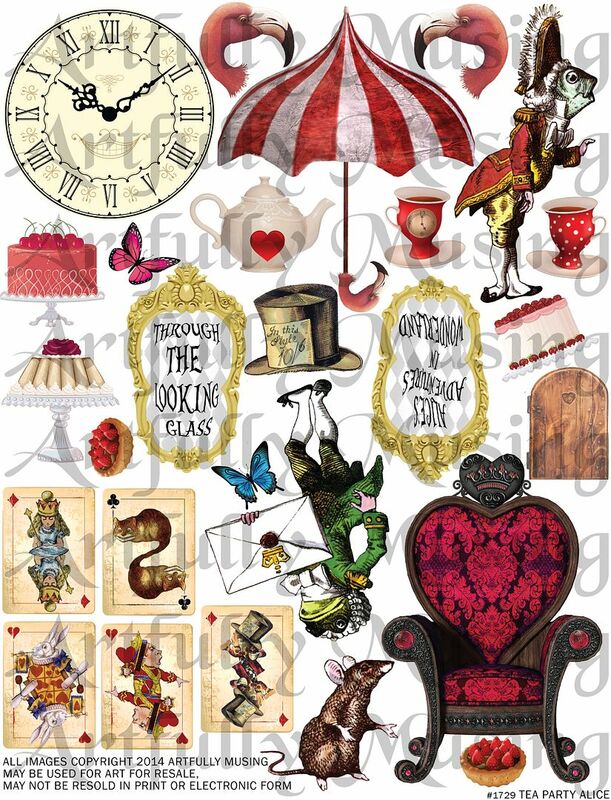 As a final touch, I added gold stickers and images from the Tea Party Alice collage sheet. 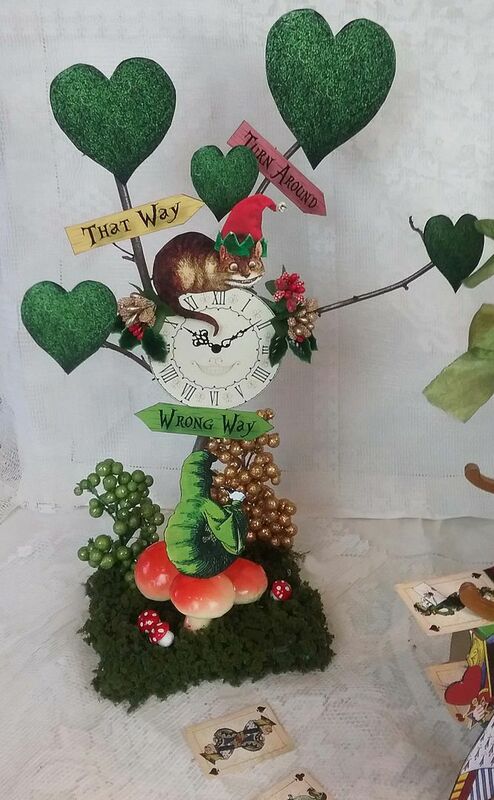 The tree is a twig from my yard that I glued into two layers of foam core that serves as the base. I’ve attached images from the collage sheet as well as large and mini mushrooms. 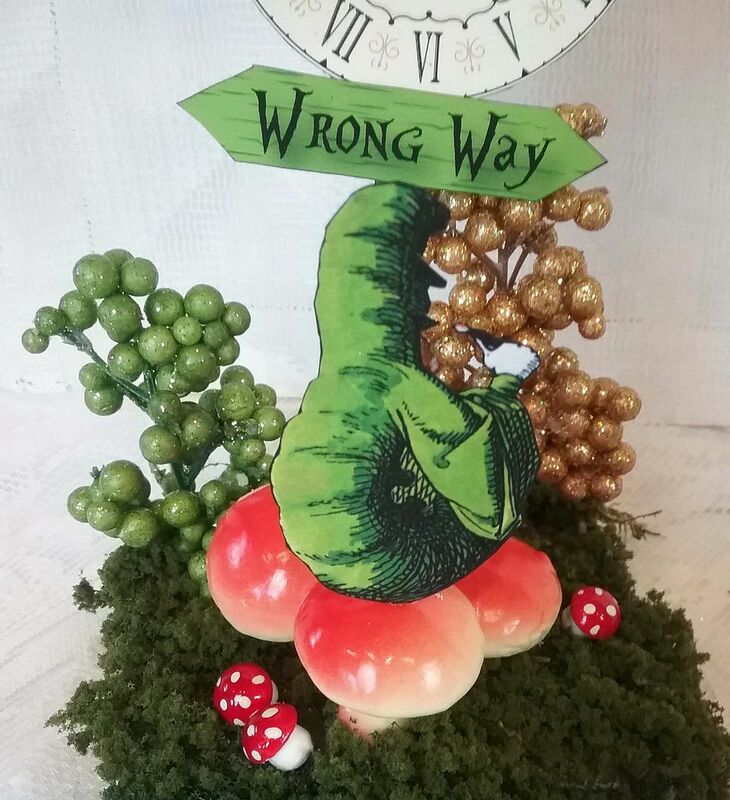 The large mushrooms are made of foam so I attached a flat toothpick to the Caterpillar and stuck it into the mushroom. The foam core base is covered with leafy green underbrush. 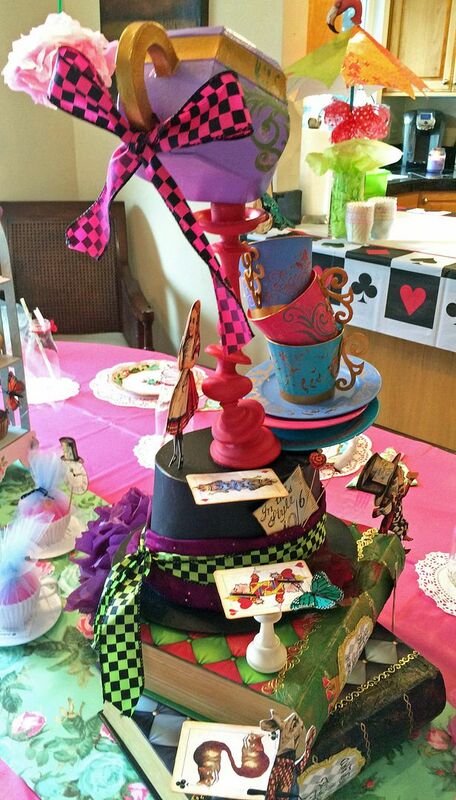 The Cheshire cat is sporting an elf’s hat.